I try my best to be organized, but sometimes even my most concerted efforts aren’t enough. I can’t even count how many times I’ve been crocheting something, put it down for five minutes, and return to find that my hook is now missing in action. Then, the hunt begins. Where’s my crochet hook? It sounds silly, but it has happened. 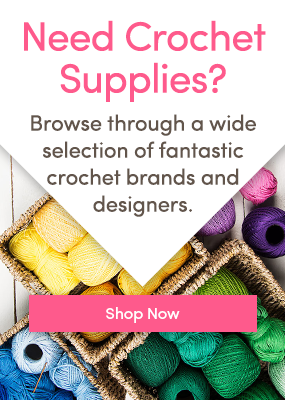 Imagine: taking your crochet project into the garden to enjoy the flowers and the green, and your hook falls under the lawn chair, or off the table and into a flower pot. I once found a hook in the corner of my garden, and I have no idea how it got there. Oops. You may think it’s crazy, but a few weeks ago I found my missing hook in my makeup bag, sandwiched between my mascara and my hairbrush. No, I don’t know how it got there, or how I managed to not notice it when it first found its way in there. I guess when crochet is your life, you don’t second guess seeing a hook, no matter how strange a place it’s in. Since crafting and cooking go together like peanut butter and jelly, it’s no surprise that hooks end up in the kitchen from time to time. Just make sure they don’t get tossed into the garbage can by non-crafting cleaners! True story: I once found a missing hook in the refrigerator. I think it got there while putting away groceries, but I’ll never really know. It’s not unusual for me to unwind at night with a few rows or rounds of my latest project. That means that sometimes, hooks fall under the bed or get lost in the piles of blankets on my bed. I’ve lost many good hooks to the tyranny of the sheets. I know – it’s probably in the yarn basket. If all else fails, I can always empty out my epic yarn stash and check the bottom of the basket – rest assured I’ll find at least 3 hooks hiding in there. The trouble is, they aren’t usually the hooks I’m looking for! Do you ever ask yourself, “Where’s my hook?” Where do yours tend to end up? Love crochet humor? Follow us on Bloglovin’ so you never miss a post. 2 Responses to Where’s my crochet hook? I have found my hook ticked into the top knot in my hair many times. I have stuck it there while answering the phone or having my hands full. One day I noticed it there while passing by a mirror. Unfortunately I had just been to the supermarket and had wandered around with two colourful metal hooks sticking out like helicopter blades. Thanks husband! He said he thought I knew that they were there? Tucked behind my ear or down behind the couch cushions.